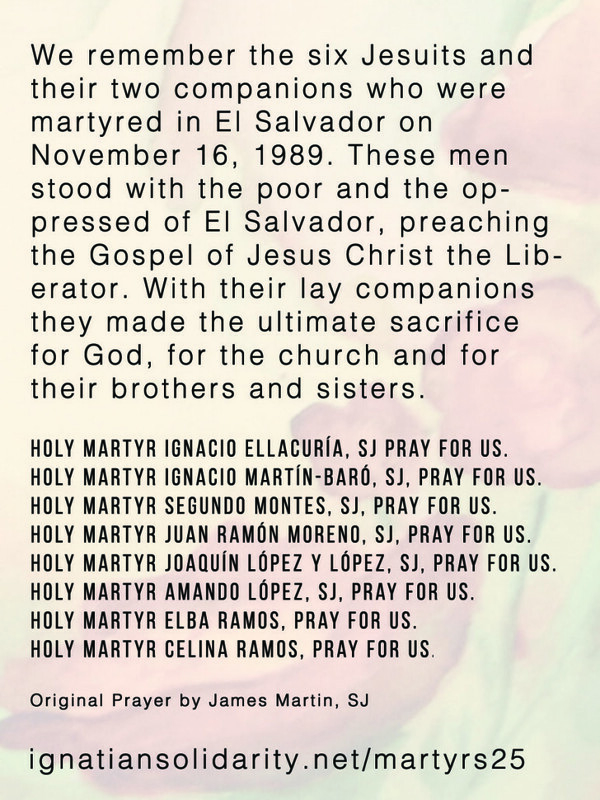 On Sunday, November 16, Creighton University hosted a Salvadoran dinner and film to inform and honor the Jesuits martyred in 1989 during the war in El Salvador. Before the film, everyone was provided a homemade Salvadoran meal by a family who owns a local restaurant here in Omaha that consisted of pupusas and tamales. The film focused specifically on the six martyred Jesuits, the housekeeper and her daughter. The Jesuits saw their mission as converting Salvadorans to become Europeans Catholics, but upon arriving and experiencing El Salvador and the people they found a new mission: to unify faith in God with justice for the people. During this time of war, the church did its best to help and support the people. Unfortunately, the church suffered the same destiny as the poor. Oscar Romero, a well-known bishop of the Catholic Church in El Salvador who was assassinated while giving mass, said earlier in his life that he did not fear death. He believed that if he died, he would be resurrected in the people. It takes a brave person to stay in a position of authority in the face of danger. The same goes for the martyred Jesuits. Many others fled and went into hiding when they heard that people were being killed, but these Jesuits held their ground. They had not done anything wrong and had nothing to hide, so they felt there was no need to leave. This is similar to Jean Donovan’s theory, an young American adult volunteer who was killed in El Salvador along with three Salvadoran nuns. She knew it was dangerous to go back to El Salvador, but she had to go back. She felt the need in her heart. In 1990, many Salvadoran students joined the military academy to help their country fight the communists, especially since the university was a definite target of the communists. They’d sing chants full of specific threats or “goals” such as, “We’re ready to kill heaps of terrorists.” Needless to say, peace wasn’t easy. One point brought up in my psychology class was the fact that to punish people who kill people, we kill those people. It seems a bit backwards and odd. Some may justify this by saying that if you kill the killers, than they will no longer be. But then what does that make you? A killer? Or a peacemaker? A war was definitely not wanted by everyone. Though wars are hoped to end in peace, many realized that at the end of this war, there would no longer be suffering, but instead there would be something worse: death. One student in particular named Espinoza came to Fort Bragg, North Carolina, to be trained to fight in the conflict. The U.S. spent a total of $15 million under the Reagan Administration on the El Salvador war to help the people fight the guerrillas who were against the Salvadoran government. The methods these newly trained soldiers used on the FMLN guerrillas were cruel. They burned their already dead bodies and shouted phrases like “May Buddha keep you company in hell.” It is understood why these soldiers were so upset by these rebels, but they seemed to have been using just as cruel methods to fight back as had been used on them. Unfortunately, a group of these U.S. trained soldiers were responsible for death of the Jesuit martyrs. Espinoza was a witness to the murders of the Jesuits. He remembers the men being ordered to tell the Jesuits to come out onto the front lawn. They were then ordered to murder them. They were given specific orders as we find out that the Jesuits were purposefully shot in the head as if to shoot out the brain or the control center of these Jesuits, as Jon Cortina explained. Cortina was good friends with the Jesuit martyrs. In fact, he lived with them. By the grace of God, he was not murdered because he was out of town during this tragic event. Knowing this makes it all the more special to be a part of the Cortina Community, a group of students who strives to live in Cortina and the other Jesuits’ footsteps by giving back to the community through service and social justice. The two women, the housekeeper and her daughter, were also killed, perhaps so there would be no surviving witnesses. They were brutally shot and died holding each other on the kitchen floor. After the film and during discussion, one audience member shared her vision with us. She asked us, “Where does our faith meet reality?” It is great to talk about all of these injustices, but what are we going to do about it? She believes that in all of the classes we take, we need to think about the poorest of the poor and what we can do to help them, even if it is just a math class. Though this vision would not be easy to accomplish, we have to remember that peace isn’t easy. 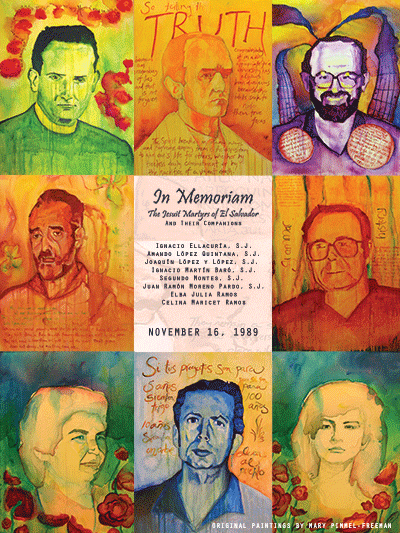 It is an incredible thing to know that we still honor the UCA/Jesuit Martyrs in 2014.